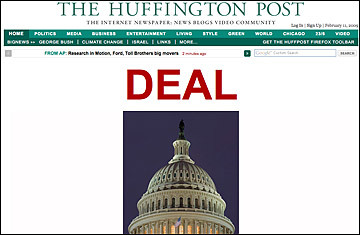 When it comes to political blogs, the Huffington Post is in a class by itself. Co-founded by socialite and aspiring talking head Arianna Huffington in 2005 as a kind of online salon, HuffPo quickly established itself as a serious go-to destination for political news and commentary. The Observer of London rightly has ranked the Huffington Post as "the most powerful blog in the world." HuffPo hasn't fallen into the usual blog trap of mistaking a rant for analysis; the site publishes consistently thoughtful commentary, lands its share of inside-the-Beltway scoops, and provides ample links to outside news sources so readers can run down stories for themselves. To top it off, Arianna Huffington seems to have come up with the first truly successful business model for blogs: most of the site's hundreds of guest bloggers write for free. Sample Huffington Post: I wonder if there's some confusion in the debate about bipartisanship stemming from the oddly chummy atmosphere inside the Beltway. Entry you'll never see: As founder of the Huffington Post, I'm haunted by the realization that many of the bloggers who write for my site don't get paid a dime. That's simply not right.